I’m going to open my vulnerable door for a moment to share something quite personal and well, embarrassing. I am a quitter. There I said it and I guess it wasn’t so scary to say. What I think is scary is the change that has to occur to stop being a quitter. Yep, I want to quit being a quitter. This is me, below… the quitter. If I put a face with this post it makes it real, I can’t hide anymore and that is an important thing, in changing this behavior, I believe. This part of me has been around since I was a child. I quit dance team, I quit cheer-leading (even though we won a trophy), I quit track, volleyball, softball. I really won’t bore you with the entire list of things in my life I have quit but let me tell you it is extensive. I often wish that at some point in my growing up period my Mom would have forced me to finish something I started. I wonder if that would have changed something in me? However, it didn’t happen that way and I am a 30 year old woman who can no longer put the blame of her life in the hands of someone else. If I am a quitter, that is because I have allowed this to continue in my life. Hopefully this post is the beginning of the end of that Corri. This all came to an emotional head last night. We live in a small town outside of Portland, Oregon. I’m an Oregon girl through and through. I grew up in Portland and we just don’t get snow in the city. So it’s a foreign thing, but always fun. Well this week we got clobbered, a foot and a half. Yes, that is clobbered to us here, don’t laugh. The weight of the heavy wet snow snapped a limb off a tree in our yard, as well as our hedges. The snow was so heavy they were leaning over to the side about ready to fall over. So hubby (who is a go getter) and I went out to try to remedy the situation. We removed the snow from the bushes then propped it up with boards so that hopefully, the hedge would continue to grow upward. During the process I was cold and wet. My hands were getting cut (it felt like) from the frozen snow on the boards. I couldn’t separate the boards that were frozen together. I would have rather just quit and gone inside. And apparently my attitude showed that. “I can’t” flowed out of my mouth like water. Over and over, “I can’t.” Well it actually turns out that I could, and did help to get this done, but it left a taste in Hubby’s mouth that he didn’t like. I think the worst thing for a go-getter is a “I Can’t” person. After a long conversation where it became PAINFULLY obvious that I have a problem with being too negative and “I can’t” but that attitude also made me feel like I couldn’t do things so just quit and move on. I laugh at quitters on tv (Ice Road Truckers is a favorite) but I am just like them. I don’t pull out that “fight for it” mentality. I got to thinking about all the things in life I start and quit. Here is a short list: Books (I love to start but rarely finish), Knitting, Exercise, Cleaning projects, Writing, Bills, Arts and Crafts etc. So last night after a bit of thinking and praying I came up with a solution to some of the smaller problems I have. If I start a knitting project or a book or something like this, I am requiring myself to touch it at LEAST one time a week until it is finished. I will start using my calendar to write down when I read or when I knitted. I will plan out a day to make soap (etc) so that these things don’t sit unused and money wasted. The bigger stuff is harder. When something becomes too hard it’s just my nature to give up. This morning on my way to work I was thinking about this. I thought of John 19:30, Jesus, our savior, was up on the cross after being beat, tortured, mocked, and spit on. First off he asked God to forgive the people because they know not what they do, but then he says in John 19:30 When Jesus therefore had received the vinegar, he said, It is finished: and he bowed his head, and gave up the ghost. IT IS FINISHED. What if Jesus didn’t finish? What if Jesus said ” you know what? You people don’t even care, you are ungrateful and uncaring and I don’t care anymore. I’m getting myself down off this cross and you all can figure it out for yourselves.” But that isn’t the way it went down because if it was, we wouldn’t have any chance of salvation, because everyone sins and we have all fallen short of the glory of God (Romans 3:23). His pure love for us and his desire to be with us forever was so great that he was willing to be killed at the hands of his creation to save it. While that same creation mocked him, told him to prove himself and come off the cross, gambled for his clothes, stuck a crown of thorns into his skin, forced him to carry his own cross, and then nailed him to it through his skin, he stuck it out and asked God to forgive them. I mean if anything was going to make someone quit, that would be it. He could have too… he could have got down off that cross and stopped everything from happening to save his own flesh, but Jesus was more than flesh. And yet there he hung, for the sins of everyone who will just accept him, no fancy prayers to say a zillion times a day, no works to get to heaven, HE paid the price and he didn’t give up on us even though we hated him. He finished. 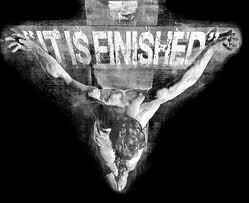 His last words were “It is finished.” Wow talk about powerful. As a follower of Christ I should be able to finish too, just because of his example. So who am I to be a quitter? Not to mention that having a positive attitude about things in general help positive things to happen to you. And I’m not talking about the hocus pocus stuff that The Secret tries to lie about. I’m talking about a positive attitude that things will turn out ok, because ultimately God is in control and when he says we go, we go. 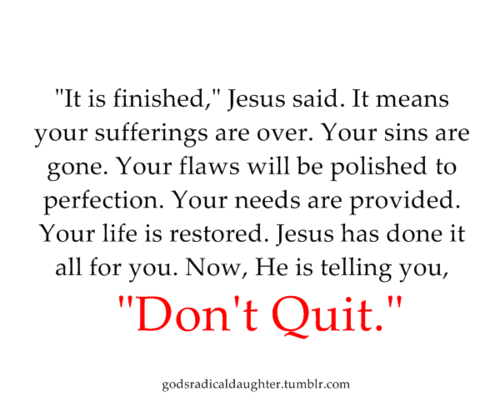 So I want to be a finisher, just like my savior was. It is time for me to grow up and get strong and start finishing things that I start. When things get hard, I find a way to keep going, I dig down deep to find that extra push to keep my legs moving, or my arm swinging, or my body working. I truly want to hear “well done” when I stand in front of Jesus and a quitter won’t hear that. Pray for me, please. The power and strength of God will help me through, because that is where strength truly comes from. Lift me up in prayer and hold me accountable. I want to be a finisher.